Nancy Bradfield’s Costume in Detail 1730-1930 (described here) explains in minute detail the construction of some caps. Based on the cap I photographed at the 1809 Hedge House, I’d say the construction was fairly simple. It’s the trimming that makes caps individual. 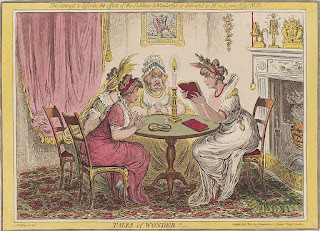 One of my favorite resources, The Lady’s Stratagem, a splendid compendium of excerpts from various manuals of the 1820s, has a section devoted to making caps, from three sources: the Manuel des dames, Manuel des demoiselles, and The Alphabetical Receipt Book and Domestic Advisor. The excerpt from the latter includes patterns. The French manuals provide as well some guidance about appropriate attire for married and unmarried ladies. 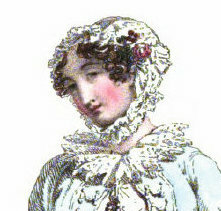 Though the French, as Fanny Trollope has pointed out, have stricter ideas about what “modest” and “simple” mean in reference to unmarried ladies’ dress, a general rule seems to apply on either side of the Channel: Married women may dress more boldly and elaborately than maidens. As to dowagers, what they wear would depend on their age and taste, I should think. We need to remember that fashion was not as standardized then as it is today. I would not expect her to wear simple hair ornaments to a ball. That seems more appropriate for a debutante. But she might wear a turban. Plumes are certainly possible. In portraits, older women are often wearing elaborate caps. However, in satirical prints, we see them in elaborate headdresses for evening dress. I suspect these are close to reality, though we can allow for some exaggeration for comic effect. Lady Wesley, thank you for the link! This was especially interesting because a good while back we had quite a discussion going, trying to figure out what bird of paradise feathers were supposed to look like. (you can read it at http://bit.ly/19seoqV) Since the ones in the video are 100 years old, they might have faded from a stronger yellow...or not. I love the idea of the caps but can't figure why one would wear them instead of hats. They do look like part of nightwear, don't they? Hat makers are wonders, aren't they?